Hotels in Bilbao are good value and you a guaranteed a warm welcome from the friendly people. Make sure you ask your hotel to recommend a good pintxos restaurant. 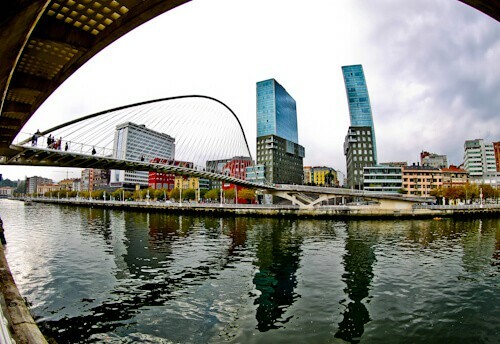 The Guggenheim museum is located along the banks of the Gervion river in central Bilbao. It’s a museum of modern and contemporary art. Because of it’s beauty it has become the iconic building of the city. It is best photographed from the other side of the river for the reflection (day or night). When they designed and built the Centro Botin building in Santander there was an influence of Bilbao. Centro Botin was designed not to become the symbol of the city as the Gugganheim museum has become in Bilbao. 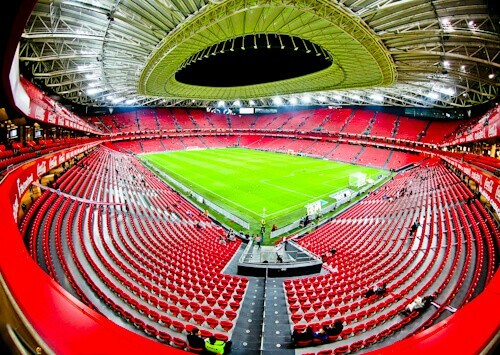 San Mamés stadium is the home of football team, Athletic Bilbao. Athletic Bilbao is a unique football team as it only fields players from the Basque region of Spain. The San Mamés stadium is brand new and one of the best stadiums in the world. You can visit for the bar for a drink with stadium views. You can take a full stadium tour. I was lucky that Athletic Bilbao were playing when I visited. Read about my VIP matchday experience at San Mamés stadium. 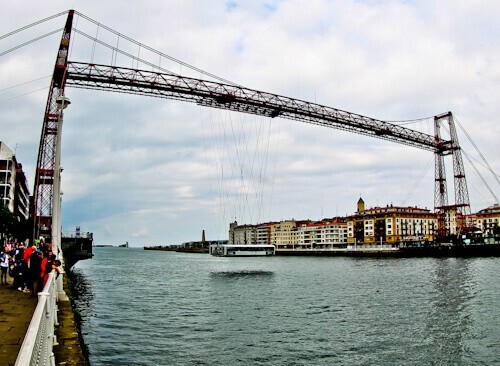 To get to Vizcaya Bridge you must take the metro to Portugalete. Vizcaya Bridge is a bridge designed by a student of Gustave Eiffel. It links Portugalete with Las Arenas. If the fact that Gustave Eiffel’s students designed this isn’t enough for you to visit then maybe the fact that it’s a UNESCO site will persuade you. It was designed so that it could transport people and cargo between the 2 locations. Transporting these whilst not blocking the big cargo ships which also use this route. You can be transported over the Nervion river for less than a euro. On the Las Arenas side of the bridge you’ll see lots of majestic buildings. The Dom Luis I bridge in Porto was also designed by a student of Gustave Eiffel, as was the Santa Justa lift in Lisbon. Plaza Nueva is located in Casco Viejo, the historic center of Bilbao. 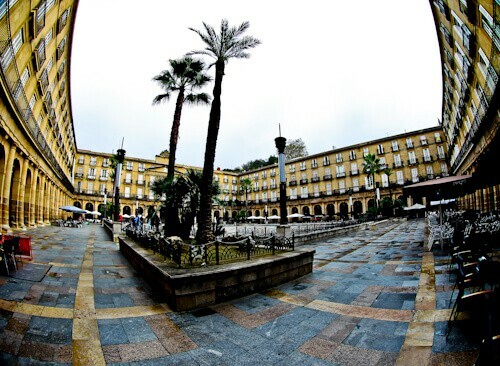 It is a typical Spanish square enclosed by buildings. It’s accessable through archways which the Spanish refer to as caves. On a nice day this is the perfect place to sit out and enjoy a drink whilst enjoying some pintxos. Surrounding the plaza are the old streets and buildings of Casco Viejo. You’ll find lots of shops and restaurants around this area. Much of it consists of narrow pedestrianized streets. The Iberdrola Tower is the tallest building in Bilbao and the Basque region. The tallest residential buildings in Bilbao are the Torres Isozaki. These are connected to the Zibizuri bridge (above). The Zibizuri is a very Instammable bridge which looks very similar to the Millennium bridge in Newcastle / Gateshead. For less than a euro you can take the funicular up Artxanda mountain. The journey takes less than 10 minutes up a steep slope. From the top you get wonderful panoramic views of Bilbao. All of Bilbao’s landmarks are clearly visible from the viewpoint. You’ll see the train station, the Guugenheim museum, towers and San Mamés stadium. Make sure it’s not cloudy when you ascend or you won’t see much. Bilbao cultural center is a very Instagram worthy location. On the outside it’s nothing special but on the inside it’s a different story. The good news is that it’s free to enter. You’ll find lots of different shaped pillars and it’s lit up using different colored lights. When I visited I had the place to myself. 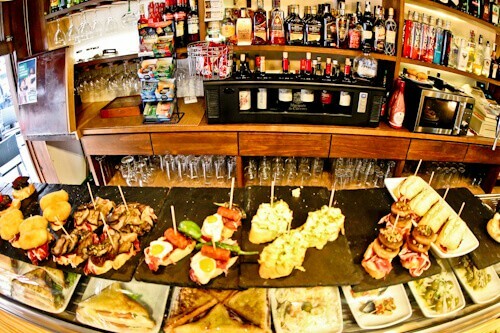 All over the city of Bilbao you’ll see restaurants and bars offering pintxos. With the friendly people of Bilbao you’ll be welcomed into the restaurants. They will do their best to speak English and explain the pintxos on sale. In my experience in Spain, the pintxos and the Bilbao service was better than a typical tapas service you’d receive elsewhere in the country. From Bilbao I took the Flixbus direct to Bordeaux. The service takes around 6 hours and stops for 30 minutes at a service station on route. If you wish to see San Sebastian, the Flixbus picks up and drops off passengers here too. As always there are plug sockets and free WiFi for the whole journey. I am fascinated by the Guggenheim Museum. But now my interest is piqued by pintxos. I only knew about tapas before. Plus I have a daughter-in-law who is Basque! Gotta visit Bilbao and the region. I’ve only been to Bilbao very briefly, and clearly I need to return! I love pinxtos, and can never say no to just one. The Guggenheim museum is stunning, that structure is so unique! I’d love to try and photograph it. Bilbao looks lovely! I am moving to Spain next year and I will be traveling all over the country to see every major city. I didn’t know there was a Guggenheim Museum in Bilbao! The Flixbus to Bordeaux sounds great, with plugs and wifi on board! 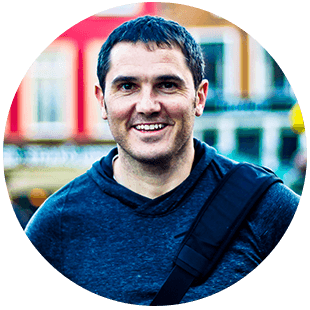 You did great at providing background information for every place listed, as well as, how to find these places. Also enjoyed the bit on Flixbus. I hear great things about them. After reading this, I truly felt I could visit Bilbao the right way. I had never heard of Bilbao before. 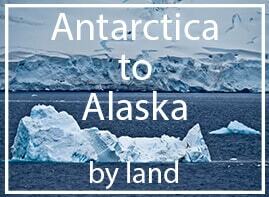 I like your blog because it gives me great ideas for road trips and offbeat destinations. My jaws dropped at the picture of San Mamés stadium. Its gorgeous! 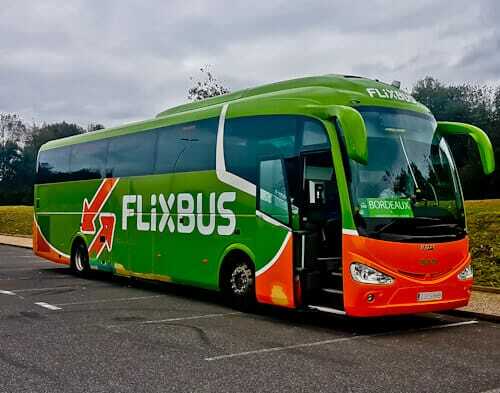 Surprised you used FlixBus, there are other bus companies which are a lot better and probably even cheaper. FlixBus has a bit of a bad rep in some ways and I personally won’t touch them because of their unreliability. Sometimes trains cost less too, if you shop around. I haven’t heard about Bilbao before this post. It seems to be one of the best locations for history buff. I loved the San Mamés stadium and also the Funicular de Artxanda. I would definitely love to experience this city. The Guggenheim museum is also fascinating in terms of the architecture. You have captured it well. 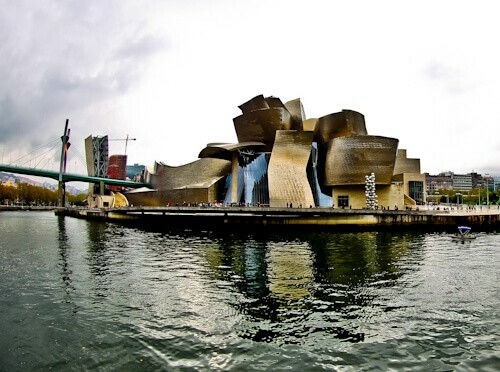 I have always wanted to visit the Guggenheim Museum, but never realised it was in Bilbao. Great post. I had never heard of Bilbao before reading this. 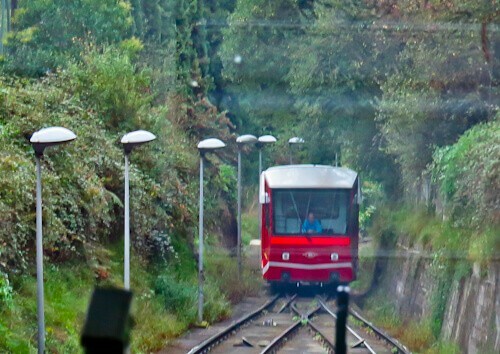 The funicular looks like fun! There are many art pieces at the Guggenheim museum that I’d like to see in person someday! Love how you captured the Spanish architecture. So beautiful! I am another person who hasn’t heard of Bilbao until now, is the Pintxos has piqued my interest, is it regional or something sold all over Spain? I love tapas so like the sound of Pintxos ???? Pintxos – one of the main reasons I really want to go to Spain – they look absolutely incredible! I heard how amazing the food is in the region and Bilbao is very high on my list! Thanks for sharing, I really think I just need to head there asap! The architecture and sights look fantastic too! Bilbao looks interesting along with the Guggenheim Museum. The Funicular de Artxanda looks like a cool ride along with some tasty food. 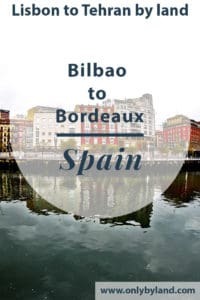 Great information for travelers and how easy it is to take the bus from Bilbao to Bordeaux. 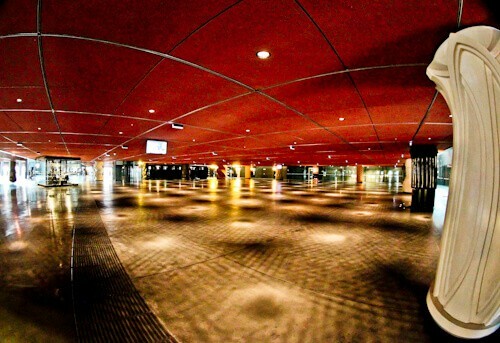 Great photos and like your fisheye lens you use to take the photographs! Pinned this for later!